SD-WANs bring powerful adaptive control to the branch edge. Beyond the edge, they typically rely on the Internet to deliver much of this benefit. This dependency has a significant risk: Internet backbones can introduce a level of unpredictability that complicates the job of delivering reliable WANs. 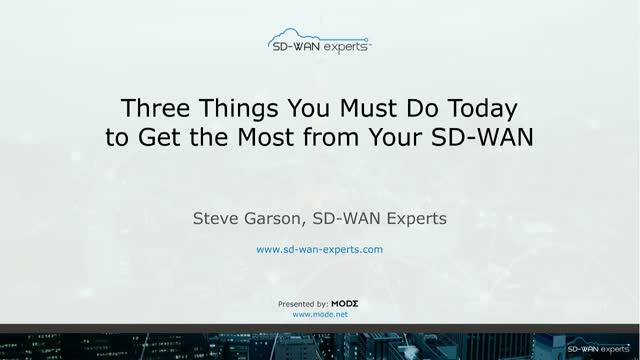 In this presentation, Steve Garson of SD-WAN Experts will detail three simple steps you can take today to mitigate Internet unpredictability, or even eliminate it entirely - all while preserving the key benefits of software-defined networking: flexibility, reliability, and economy.